Etsy has expanded far from its frontiers. It went from being an online website where self made artist, and crafters sell their own creations, such as necklaces, unique Disney inspired ear headbands, paintings and much more, to becoming a mobile app, to now something even greater. Etsy served as an inspiration to Stephanie Payan and other artisans to form the SoCal Etsy Guild community. With the creation of this community they offered an opportunity that went beyond Etsy’s option of buying on the go. The SoCal Etsy Guild made tangible Etsy markets available to the people of California. This markets are made up of local artists and crafters, serving as vendors, that come together to sell their items in person. SoCal Etsy Guild markets hit San Diego in mid summer of 2017, and within a short period became extremely popular that they can now be found in two locations in San Diego. On the first Saturday of each month the market can be found in Mission Mall in between Michaels, and Nordstrom, while on the third Saturday of each month it is located at Horton Plaza on the waterfront patio. Instead of browsing online San Diegans can now browse through the rows of stands filled with a variety of the same goods available online, but with less worries. One gets to see the product finished, and in person, leaving no space for weird, and unexpected surprises. Also, customers get to take it with them the moment they pay, no waiting time, and no need to pay a shipping fee. Can’t get any better than that, well no, it does. At this markets, some artists place their items at a lower price with great offers. SoCal Etsy Guild markets rise above expectations when it comes to benefits to the customers, and it’s great. People love to see the products before buying it, and what puts the cherry on top of everything is that one is able to meet the artists in person. Shining light on local artists is amazing, and it’s always great to know who your money is going to. What better way to help our communities than by supporting our local artists, instead of high corporates. Looking for something cool to do this Thursday? Well look no further, because KCR’s got you covered! This Thursday, July 16th, there are two pretty awesome events happening for all you art enthusiasts. The Museum of Contemporary Art San Diego is holding a Thursday Night Thing event from 7PM-10PM. The new exhibition, open for the public on Thursday, is composed of three different projects exploring the geography and cultural history of the region. The projects featured are those of Anya Gallacio , Byron Kim, and Jock Reynolds & Suzanne Helmuth, which could be explored with the help of the MCASD Gallery Educators in the guided tours provided for guests attending. Other activities also include a 3D printing demonstration with Fab Lab San Diego and making black-on-black paintings inspired by the work of Byron Kim, who is among the three projects being shown at the MCASD. At 7:30PM, the party kicks off with some live music provided by Kyle-m with an all vinyl DJ set, who is then followed by band Chicano Batman at 9PM. Dance the night away, enjoy some drinks at the bar, or snack on some food truck treats. Whatever you do, you’re going to be doing it to some sweet sounds. This event is free for Members (who will also receive their choice between a free cocktail or beer), $8 for students and seniors, and $10 for non-members. Tickets to this TNT event can be purchased here, but if you want to keep coming back for more TNT events, become a member! 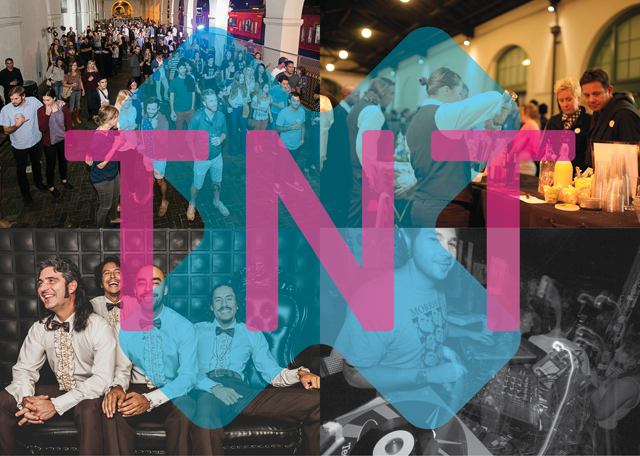 Being a member costs $5 a month, which gets you free admission to every TNT and a free cocktail/beer every event. Now isn’t that a steal? Take advantage of this deal and join today! Right across from the MCASD, the SDSU Downtown Gallery is holding a live drawing event from 6PM-9PM that Thursday as well! 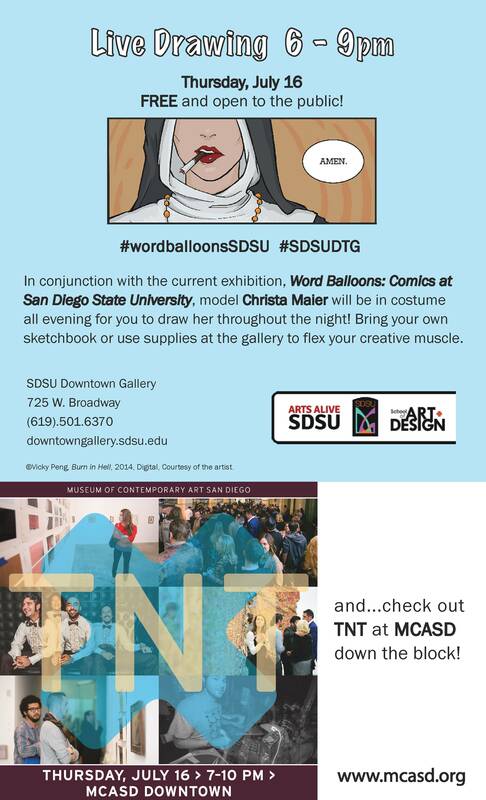 Model Christa Maier will be in costume for you to draw her throughout the night, so swing by with your sketchpads and get to drawing! Materials such as drawing boards, sketchpads, and pencils will be provided if you’re running low on supplies. No worries, we’ve got you covered! Make your Thursday night special by submerging yourself in the San Diego art scene! You’re sure to have a blast.